We started a series of blog posts to share some of our views and lessons learned on these topics. The first one, Five Pressing Issues Confronting Multinationals in Latin America, provides an overview and sets up the discussion context. In this post, we will delve into the role of understanding how cost to serve (CTS) is of vital importance for LatAm Multinationals, and how it should be leveraged to improve profitability. The world of business is getting more competitive, and customers are becoming more demanding. So being able to analyze and quantify the costs associated with each activity involved in fulfilling demand—including procurement, manufacturing, distribution, logistics and sales—at a product and customer level is key to improving profitability and staying competitive. However, access to consistent data across the supply chain is a pervasive challenge in general, but when dealing with this complication can be exacerbated by currency fluctuations, local nuances and other factors. Cost to serve is a powerful cost and profitability management tool derived from activity-based costing methodology, which allows for an accurate understanding of the profitability of a product or product category for each customer and end-point. The main objective of this methodology is to calculate the end-to-end cost of delivering a product or service to a customer, taking into consideration all activities necessary to complete delivery and collect product revenue, and identifying which customers are profitable and which are actually generating losses. Traditional accounting methods only consider the gross margin where the cost of goods sold to a customer is subtracted from the net sales value. But this approach provides little information that can be used in decision-making, and it can also often be misleading. There are a series of other costs that are significant and should be considered in order to correctly evaluate the profitability of customers. These are the Costs to Serve that customer. How much time of the sales team does this customer require? What are the logistics costs? What is the frequency of deliveries and what are the return freight costs? Only when all of these costs associated with the various activities involved in the process are perfectly identified and allocated to each individual customer, is when you can calculate the actual profitability of each customer. And that is where cost to serve customer profitability analysis differs from the traditional accounting methods. It looks beyond the traditional measures, giving a truer picture of profitability and what value, if any, the customers deliver to the bottom line. Based on this analysis, companies can identify and separate their“winners”, who should be defended against the competition, from their “losers”, who are costing them money. As previously mentioned there are several cost elements that affect the complete end-to-end cost to serve a customer and that need to be considered. In order to calculate the cost to serve, a portion of the total costs incurred during these activities is allocated to each customer based on certain cost allocation criteria. 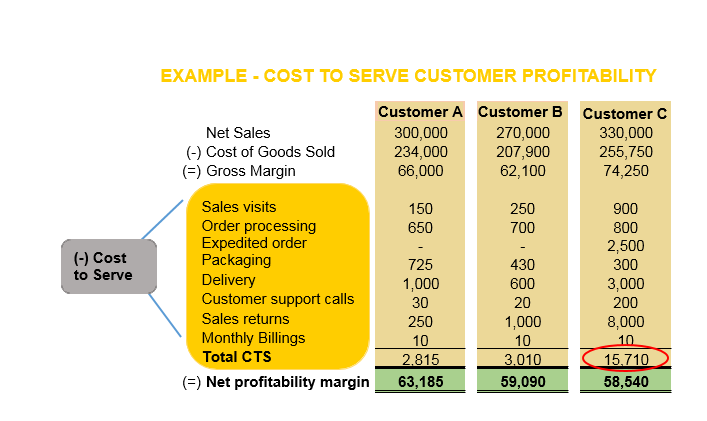 The figure below shows an example of how to calculate CTS customer profitability for a CPG (Consumer Product Goods) manufacturer and how costs may vary when serving the same product to different customers. Even though Customer C had the highest sales, it generated the lowest profit due to having a very high cost to serve, mainly from substantial delivery and returns costs. Knowing the cost to serve of each customer gives companies better visibility on those customers who are positively contributing to the bottom line and those who aren’t, and enables them to make informed choices in order to transform unprofitable customers into profitable ones. It also allows companies to better control different commercial strategies, improve and optimize high cost processes, and if a merger or acquisition is being considered, it can show where additional value can be unlocked if underpricing or over-serving is happening. 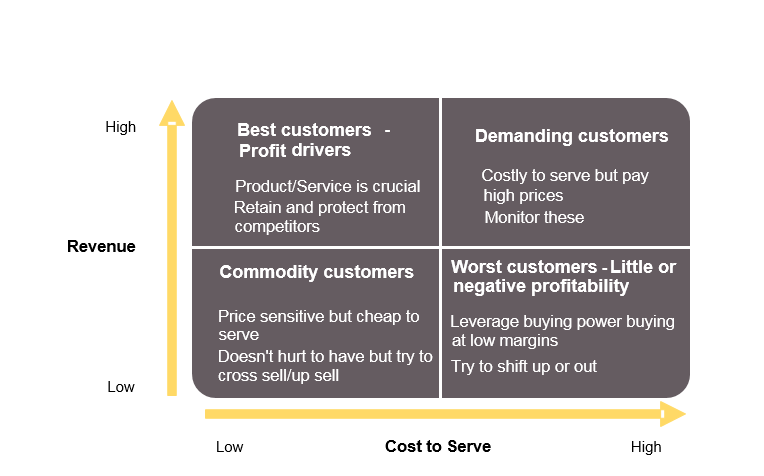 Classifying existing clients into four quadrants based on cost to serve and revenue can give great insight into where each customer stands and which strategies the company should adopt to improve profitability. Based on their analysis of the quadrants, companies can come up with strategic opportunities to make all customers more profitable by driving them to the upper left quadrant. It is not enough to know how much you sell and to whom. In today’s competitive environment, it’s crucial to know how much you effectively profit from each customer, in order to identify where to properly allocate logistics and sales efforts. The collection and interpretation of data can be a large task, so having a funded project supported by senior management and implemented as an organization-wide effort—not just a logistics exercise—is key. Building the right cost-to-serve capability is a tall order, but once in place, it can become a significant competitive advantage. Do you know how profitable your customers are? Can you tell the winners apart from the losers? Lua works in Auxis’ LatAm Advisory practice. She has shared services experience across multiple industry verticals within Latin America. 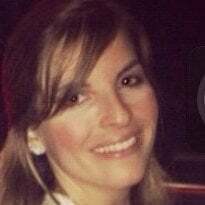 With outstanding experience working with senior executives at large global organizations across LatAm, she is proficient in all facets of Business Process Improvement and Shared Services Implementations.